[Bozeman, MT] — Mar. 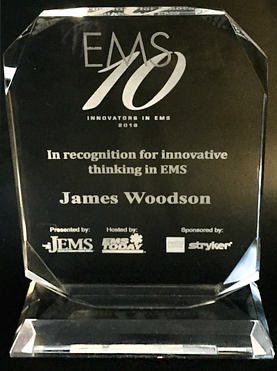 23, 2017 — James Woodson, MD, Founder and CEO of Pulsara, was recognized as a recipient of an EMS10: Innovators in EMS 2016 Award at a ceremony at the EMS Today Conference & Exposition last month. Hosted by the Journal of Emergency Medical Services (JEMS) and sponsored by Physio-Control, a part of Stryker Corporation, the EMS10 awards recognize ten individuals who made significant innovative contributions in EMS in the previous year. Over 40 nominations were considered for this year’s award. A panel of EMS professionals selected the ten distinguished winners, who “each displayed initiative, creative thinking, action-orientation and a desire to positively impact EMS, patients, and their communities,” according to JEMS. The EMS10 winners received recognition at EMS Today in Salt Lake City, Utah, on February 22nd at a special awards dinner with former winners. This year’s banquet marked the ninth anniversary of the program, which identifies the top innovators in the EMS industry and raises awareness of their contributions in order to benefit providers and patients in the future. Each award recipient will be profiled in depth in the April 2017 issue of JEMS. In October 2016, Pulsara launched the Prehospital Alerting Package, which allows EMS providers to enter patient information and instantly transmit it to the emergency department from the scene or ambulance. Because the information is stored in the cloud, and not on the user’s device, the platform is HIPAA-compliant and secure. Pulsara also allows the medic to upload a secure image of an injury, ECG, or anything else they deem helpful, and automatically notifies the hospital of the ambulance’s location and ETA based on GPS. The emergency department team can view the information and send instant messages back to the EMS team via the secure chat feature. This instant communication keeps all team members — both in the hospital and in the field — on the same page and reduces the likelihood for miscommunication and medical errors. According to Dr. Woodson, the motivation for Pulsara comes in part from the communication crisis in healthcare. Published data shows that medical errors account for 400,000 deaths per year and 10,000 serious medical complications each day, with 80% of those secondary to miscommunication during transitions of care. In addition to these errors, many patients also suffer preventable delays in treatment during time-sensitive emergencies where every second counts and time is tissue. When "time is brain," wasted minutes can mean the difference between living a happy, active life and being confined to a nursing home. In some cases, delays in treatment can even lead to death. Dr. Woodson is frequently invited to national events to speak about communication problems in healthcare and the potential of mobile technology as part of the solution. The benefits of Pulsara, which Dr. Woodson created to solve problems he saw while working emergency rooms, have been demonstrated by research published in peer-reviewed journals. The platform is currently used by hospitals and EMS systems in 13 states plus Australia. Pulsara is a digital healthcare corporation that focuses on using mobile technology to enhance treatment time outcomes by improving communication and care coordination through the entire healthcare system. 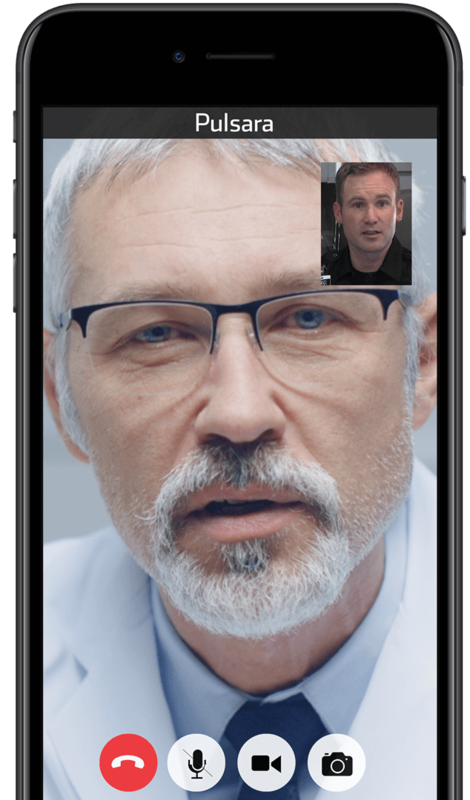 Pulsara’s mobile application packages for stroke, STEMI, and general patients improve communications between the teams caring for those critical patients, leading to faster treatment and better outcomes. Every clinician – from paramedics to emergency department staff to neurology and cardiology teams – is on the same page with a simple tap. For more information, visit https://www.pulsara.com.